Jiuzhaigou (九寨沟 Jiǔzhàigōu)  is a nature reserve in the north of Sichuan province in central China. It is officially known as Jiuzhai Valley in English. It is known as the habitat of giant pandas (although it is extremely rare to ever see a panda in the park) and mainly for its many multi-level waterfalls and colorful lakes. It was declared a UNESCO World Heritage Site in 1992. It belongs to the category V (Protected Landscape) in the IUCN system of protected area categorization. Jiuzhai Valley (Jiuzhaigou) is a major feature of the Sichuan Scenic Area, located 350 km north of Chengdu, the capital of Sichuan province. 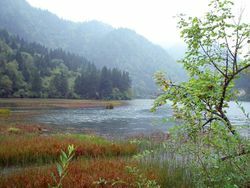 Jiuzhaigou is at the northeastern end of this scenic area in the Min Shan mountains. It is part of the Aba Tibetan and Qiang Autonomous Prefecture. The main scenic area stretches 80 km (50 mi) long in the form of a letter Y comprising of three main valleys - Shuzheng, Rize and Zechawa covering 720 km² (278 mi²) and offering stunning views of lakes, waterfalls, and mountains. The name means "Valley of Nine Villages", derived from the 9 ancient Tibetan villages that call it home. Its highest point is 4,700 m (15,420 ft) above sea level, with the main sightseeing areas between 1,980 m and 3,100 m (6,500-10,170 ft). The remote region was inhabited by various Tibetan and Qiang peoples for centuries, but was not officially discovered by the government until 1972. Extensive logging took place until 1979, when the Chinese government banned such activities. The area was made into a national park in 1982. An Administration Bureau was established and the site officially opened to tourism in 1984. Layout of facilities and regulations were completed in 1987. The site was inscribed by UNESCO as a World Heritage Site in 1992 and a World Biosphere Reserve in 1997. 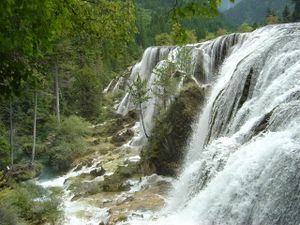 In 2007, over 2.5 million people visited Jiuzhaigou. The site averages 7,000 visits per day, with a publicly reported cap of 12,000 (however this is never enforced). The desire to balance environmental protection and mass tourism has become an increasingly acute challenge for park management. Jiuzhaigou's landscape is made up of high-altitude karsts shaped by glacial, hydrological and tectonic activity. It lies on major fault lines on the diverging belt between the Tibetan Plateau and the Yangtze Plate, and earthquakes have also shaped the landscape. The rock strata is mostly made up of carbonate rocks such dolomite and tufa, as well as some sandstone and shales. The valley includes the catchment area of three gullies (which due to their large size are often called valleys themselves), and is one of the sources of the Jialing River, part of the Yangtze River system. The area covering 720 km² (278 mi²) of the Minshan mountains provides the catchment for the water system of Jiuzhaigou. Jiuzhaigou's best-known feature is its dozens of blue, green and turquoise-colored lakes. Originating in glacial activity, they were dammed by rockfalls and other natural phenomena, then solidified by processes of carbonate deposition (travertine). Jiuzhaigou's water has a high concentration of calcium carbonate, making it so clear that the bottom is often visible even at high depths. The lakes vary in color and aspect according to their depths, residues, and surroundings. The park is the natural habitat for two of China’s most treasured endangered species – the Giant Panda and the Sichuan Golden Snub-Nosed Monkey (金丝猴). However, due to the park's size and the number of tourists, the chances of seeing them are slim. About 20 pandas reportedly live within the boundaries of the park. There is probably higher chance of seeing them in Zaru Valley, the valley dedicated to eco-tourism as of July 2009. In the main valleys you are more likely to see other creatures including birds (140 species have been recorded here), insects and fish. Despite all the lakes in the park, Jiuzhaigou is amazingly free of mosquitoes. Nearly 300 km² (115 mi²) of the core scenic area is covered by virgin mixed forests. The flora changes greatly with altitude. In the lower regions of the valley, grasses and reeds abound. These are quickly replaced by bamboo forests which in turn give way to deciduous trees and conifers at the upper end of the valley. Beyond them the rocky slopes and snow-capped peaks of the Min Shan range dominate the view. 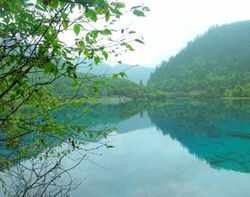 The most comfortable climate to Jiuzhaigou Nature Reserve is in July. It's warm. The scenic area of the park is situated at a height of between 2,000 and 3,000 m (6,562-9,843 ft). In summer the winds blow predominantly from the south and in the winter from the north. The following table shows the average monthly temperature and rainfall. Umbrellas and wet weather clothing as well as sun protection and hats are highly recommended as the weather at these altitudes can be fickle. The main departure points for a visit to Jiuzhaigou are Chengdu - the capital city of Sichuan, famous for its Panda Breeding Centre - Chongqing and Xi'an. Although Jiuzhaigou is only around 350km from Mianyang, and 460km from Chengdu (as the crow flies), the journey takes between 8 and 11 hours due to the winding mountain roads through some spectacular scenery along the valleys of the Fu or Min rivers. Many tour companies break the journey into two components with overnight stops either at Mianyang or Maoxian. If the area has experienced heavy rain, the mountain road to Jiuzhaigou may be closed. This can mean that there may be a delay as traffic backs up to wait for the road to reopen. In extreme cases, the road may not reopen at all, meaning that the bus and its passengers will have to spend the night in the non-descript Dujiangyan City, trying again in the morning. This was the case on one occasion in June 2011. If you are travelling during these conditions, you may have to be very flexible with your itinerary. Flights between Chengdu and Jiuzhaigou Huanglong airport (IATA: JZH) are available on Air China, Sichuan Airlines, Hainan Airlines, South China Airways, and China Eastern. Direct flights are also available to Huanglong airport from major cities Beijing, Shanghai and Hangzhou during summer time. Huanglong airport is about a 1.5-hour drive from the park entrance. This can be done by taxi or mini-bus. Taxi costs 200 RMB. The airport shuttle bus costs 50 RMB per person. There is also an airport shuttle bus that goes from Huanglong airport, stopping over at Huanglong Scenic Area and going onwards to Jiuzhaigou Park entrance; the ticket costs 120RMB per person. The trip from the airport to Huanglong takes one hour and the driver will wait for 4 hours, then depart to Jiuzhaigou. Remember to get the driver's number before you make the trek through Huanglong(However, the driver will very likely not know English). Huanglong can easily be visited within 4 hours. Most visitors access Juizhaigou by road. From Mianyang an early morning start gets you to Jiuzhaigou township in time for dinner and the Tibetan cultural show (¥120-320). The route initially follows the deep valley of the Fu river then over Longmen shan (Dragon gate mountain) to Qingchuan and Wenxian before reaching Jiuzhaigou County Town nestled in the valley of the Baishui river. The mountain and river views make even the journey a worth while tourist experience. Public Bus services are available from the Xinnanmen and Chadianzi bus stations in Chengdu to Jiuzhaigou (10 hours) with 2 or 3 departures from each station daily depending on demand. Ticket price is approximately ¥145-2014,November. There are daily buses to the park from Songpan, and Huanglongsi National Park, as well as Lanzhou in Gansu (13hours). Taxi: If there are a few people, it may make sense to charter a taxi to/from where you're going. Fares of ¥600-700 to Langmusi (?) have been reported. It is also reportedly possible to take a taxi to/from Chengdu for around ¥1200, which is probably cheaper than flying for 3 people and much more comfortable than a bus. The Jiuzhaigou Administration centre contains the Ticket Office. Tickets are sold from 7:00AM until 5PM daily(The park is open between 7am and 7pm). If you have a Chinese bank card you can use one of the 24/7 self-serving machines to buy the tickets. During off-peak season (16 Nov - 31 March), the park ticket office opens at 8:00am and closes at 4pm (the park itself closes at 6pm). The price during peak season is ¥220, and there in an optional insurance fee of ¥20. Disabled visitors, seniors between 60 and 70 years of age, students and soldiers get a discount price of ¥110. Children no taller than 1.3m in height, government servants, and seniors over 70 get in free. A one day bus ticket costs ¥90. The ticket is compulsory and you need one as it is over 30 km from the entrance to the top of the park, which is certainly too far to walk in a day. Tickets are only valid for one day. Previously there were two day tickets that are no longer on sale during the peak season. These are on sale in the off peak season. Entry – ¥80. Warning about off-peak visits: In the off-peak season, large parts of the wooden trails in the park are closed, making it impossible to hike around the trails. Also, the farther parts of the park are closed off (even the buses wont go there, stopping at the Arrow Bamboo Lake or earlier, please check the map here). Walking on the roads meant for the buses is not allowed (there are occasionally staff who will request you to stay off the roads), and not recommended, especially considering the occasional spots of snow and rather wanton driving style of the bus drivers. You can easily cover all the accessible areas of the park in less than one day during the off-peak season, as most of the walking trails are closed, and you will need to take the bus to get around, get off at designated spots, take pictures and get back on the bus. Winter 2nd day entry ticket: ¥20 (must be purchased at the same time as the first day's ticket). You need to buy another bus ticket (¥80/pax) if you plan to use the bus service on the second day. 2017 earthquake update: Since the park was reopened after the last year's earthquake, it might not longer be possible for individual tourists to visit the park. According to the information on the official website, the park only accepts tour groups and a maximum of 2000 visitors a day. Because of this new quota, tickets might be sold out weeks in advance. Make sure you check ticket availability before you go. There are plenty of taxis in Jiuzhaigou. 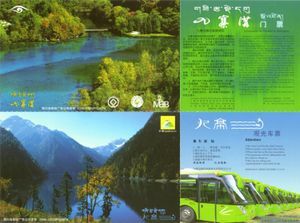 There are also mini-buses (they really are minivans) to the most popular tourist destinations in the Jiuzhaigou region. Car Rentals are also available and range from ¥500-900per day. From Chengdu the public bus costs between ¥110-145 and takes around 9 hours. Jiuzhaigou is all about seeing! The colours of its lakes, trees and mountains are breathtaking and defy adequate description. The altitude changes within the valley to create continual variations of flora, which give each lake and waterfall a unique quality. Although Jiuzhaigou is a great place to visit at any time of the year Spring and autumn are best. In winter time, some of the lakes are frozen while others are not. The blue-green color of the water is distinctly visible even in winter, however it is not as striking as during warmer weather against the backdrop of the greenery around. Moreover, the day temperatures are very low and accessibility by road is neither easy nor guarantee-able. Summers can be quite crowded with beautiful sunshine in the early parts and it often rains in July and August. The fresh air and lack of humidity make it a great break from other cities in Sichuan province. Autumn is, in many opinions, the pick of the seasons. Be warned of extremely large crowds everywhere and terribly high prices during Autumn. In late September through October to early November, the colour contrasts of red and gold leaves set against the greys of the Bamboo forest and the dark greens of the conifers provide the perfect backdrop to the blue, cyan and vivid greens lakes. Long Lake(长海） is at the head of the Zechawa valley. At an altitude of 3,060 m (10,039 ft) this is the biggest and deepest lake in Jiuzhaigou. The lake has a surface area of approximately 30 sq km’s (12 mi) and an average depth of 44 m (144 ft). On clear days its dark wooded hillsides and blue waters are viewed against the backdrop of the 5,000 m (16,404 ft) snow capped Min Shan mountains. This lake has no major inflow and receives its water from underground sources. The local Tibetans have their own name for this lake, which translates, to “The Lake that never dries out.” Take the bus to the Long Lake and Jade Colored Pool because it is too far to walk to. Five Colour Pool(五彩池） also known as the Jade pool, is a small lake of 5,600 sq m (60,000 sq ft) at an altitude of 2,995 m (9,826 ft) and with an average depth of 6.6 m (21.5 ft). It is fed by underground streams from Long lake. Although small this lake must be rated as having one of the most varied and intense colour ranges of Jiuzhaigou and should not be missed. The lake systems in the lower parts of Zechawa valley are seasonal and are often dry in summer. Walkways are provided from Long Lake to a bus pickup point just passed the lower seasonal lake. Grass Lake at 2,910 m (9,547 ft) is the highest lake in the Rize Valley. The valley here is narrow and steep. The lake was formed as a result of an ancient mudflow about 10,000 years ago and travertine sedimentation. The lake is shallow with large evergreen grassy beds. At an elevation of 2,905 m (9,530 ft) Swan Lake is surrounded by high rocky cliffs that drop vertically into the lake. The lake takes is name from large numbers of migratory swans that visit it each year. Arrow Bamboo Lake（箭竹海） is the first of the deep lakes. Set at an altitude of 2,680 m (8,793 ft) and 6 m (20 ft) deep it has a surface area of 170,000 sq m (1,830,000 sq ft). An unusual characteristic of this lake is that it never freezes even when the Panda Lake 100 m (328 ft) lower is completely covered in snow and ice. The lake is surrounded by Bamboo groves and together with the Panda Lake. Panda Lake（熊猫海） has an average depth of 14 m (46 ft) and as its name implies is in the heart of panda country. This 90,000 sq m (969,000 sq ft) lake at 2,590 m (8,500 ft) altitude is surrounded by bamboo forests and a mix of deciduous and coniferous woodland. This vivid green lake becomes a feast of colour in the autumn. The lake is home to many small and curious Songpan Naked Carp that gather in large numbers when a leaf or pebble falls into the lake. The fish are protected and must not be fed by visitors. Water exits Panda Lake via the spectacular Panda Falls（熊猫瀑布）. These narrow falls have a drop height of 120 m (393 ft) and cascade down to the “Five Flower Lake” over a series of travertine terraces. A well-maintained wooden walkway allows visitors to descend beside the falls providing a unique way of seeing the spectacle. Pearl Shoal and Pearl Shoal Falls（珍珠滩瀑布） are best viewed by taking the walkway. This takes visitors across the “Golden Bell Lake” and “Pearl Shoal” down the left side of the falls then across the base of the Falls to “Mirror Lake”. The shallow waters rush over the 160-m (525 ft) wide travertine shelf called” Pearl Shoal” creating a noisy bubbling cascade which from a distance looks like a shawl of pearls draped across the hillside. The falls have a drop height of 21 m (69 ft) and are 162 m (532 ft) wide providing a spectacular display. Mirror Lake（镜海） is so named because of its ability to reflect the images of the surrounding mountains and forests. 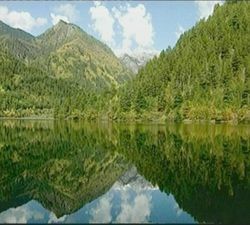 The lake at an altitude of 2,410 m (7,907 ft) is in a sheltered section of the valley running east west which produces its glassy reflective surface.The Lake was featured in the Zhang Yimou movie Hero. The outflow of “Mirror Lake” is through the “Rize Gully” a travertine ramp of small ponds and natural bonsai trees and bushes that lead directly to one of the great sights of Jiuzhaigou . The Nuorilang waterfall. The Nuorilang Falls（诺日朗瀑布） are situated, at an altitude of 2,365 m (7,760 ft), at the junction of the Zechawa, Rize and Shuzheng valleys. Best viewed from the Shuzheng valley road the 250-m (820 ft) wide veil of water flows out of the thick shrubs and bushes of Rize Gully to drop 24 m (79 ft) into a small ravine below the road. Rhinoceros Lake（犀牛海） at 2,315 m (7,696 ft) and with a surface area of some 200,000 sq m (2,153,000 sq ft) is the largest lake in the Shuzheng valley, and also the deepest with an average depth of 12 m (39 ft). The lake derives its name from a legend that tells of a monk from Tibet riding a rhinoceros. When the monk came to this lake he was so entranced with the local scenery that he accidentally rode his rhinoceros directly into the lake. Shuzheng Village（树正寨） bedecked with prayer flags, is one of the nine Tibetan villages that give Jiuzhaigou its name. Situated above the Shuzheng Lakes（树正群海） it is easily accessed from the roadway. Here you can visit a traditional Tibetan home and drink “Yak Butter tea“. The steep main street is lined with shops selling trinkets, Tibetan artifacts and souvenirs. Shuzheng Lakes（树正群海） and waterfalls are at 2,215 m (7,268 ft) the lowest series of lakes in Jiuzhaigou; Spread across the valley this series of small lakes and waterfalls cascade down the lower valley and drain directly into Baishui Jiang. The last three features are the Sleeping Dragon Lake, Reed Lake and Bonsai beach. Sleeping Dragon Lake contains a large travertine shelf that extends across the floor of the lake. Locals say it looks like a sleeping dragon and that the head and tail seem to move as the wind ripples the lake surface. It is possible to see the whole park in a day. You should buy the ticket the day before in one of the self serving machines(get the full ticket; entrance + bus pass 310 RMB), then enter the park at 7am (Unsure, a taxi driver told me they allow people at 6:30 but the website clearly says 7:00 am) and take the bus up the right fork to Primeval Forest（原始森林）. Walk the trail around the forest then walk the forest path down to Swan Lake. It is advisable then to bus down to Arrow Bamboo Lake and then walk all the way down to Nuorilang. Have your lunch at the cafeteria near the tourist center(I'd skip the lunch and just snack on the way). Then take the bus that goes to the Long Lake and make your way down to Five Colour Pool. Subsequently, bus down to Nuorilang and walk till the Bonsai beach before taking the bus to the entrance. Be sure to get on the correct bus at the fork after Nuorilong because if you accidentally get on a bus towards the entrance there are no more bus stops in the other direction towards Long Lake! Hike outside of the park If you’re staying in Jiuzhaigou for more than one day and don’t feel like paying another 200+ RMB on visiting neighboring natural parks or "authentic Tibetan villages", consider this little trail. It offers great views on the surrounding moutains as well as cute little picnic spots away from the crowds. From the entrance to Jiuzhaigou park, walk upstream along the river (in the opposite direction of the bus station) for about 20 to 30 minutes. When you see a rather large steel bridge with some advertisements for hotels on your left side, turn in there onto a gravel road that winds its way up the mountain. You will pass some houses, until the gravel road stops at a high wooden pole. Look closely on the left side and a tiny dirt path continues up to the mountain. There are lots of fragrant herbs and interesting little wildlife along the path, and in 2014 it seemed largely abandoned and undiscovered by tourists. There are lots of Tibetian trinkets that could entice the younger ladies. There is a shop next to the entrance which sells a good collection of postcards and reading materials about the park itself. Being a UNESCO World Heritage Park in China does not mean it is fully decked out for non-Chinese visitors. There is a centrally located, sort of a HQ area with a restaurant serving buffet lunch. Typically Chinese stir-fry dishes. Buffet lunch for 60 RMB. At the entrance, there is a Dico's (Chinese fast food outlet) serving burgers, fried chicken, french fries and standard fast food fare at normal prices. There are also vendors selling overpriced noodles. A one-day stock of muesli bars and a flask of tea or coffee would help, especially if you plan to take in all the heavenly sights on foot, through the wooden planked pathways. In autumn and spring, the temperature is suitable for resting along the wooden plank path while having a nice warm drink while you wait for the lighting to be just right for your next photo shoot. note - the food and drink in the Reserve is quite expensive by local standards (dish of rice about ¥30, noodles ¥15, Small bottle of water ¥5) so it's a good idea to obtain supplies in the shops outside before you enter. There are many areas to drink. You will find one of the best local Tibetan tradition is to drink Tibetan butter tea. There is a surprising amount of bars available on bian bian jie (边边街) which is one of the most famous cobblestone roads in China. Despite whatever they tell you, lodging in the park is illegal. It IS possible though (May 2014), but only by arrangement with the local villagers. There are no hotels or commercial accommodation inside the park, although there are several hotels and hostels within walking distance of the main entrance to the park. If you have a short stay in Jiuzhaigou, it is recommended to stay at one of the hotels close to (within walking distance of) the park entrance, so you do not have to deal with the hassle of finding a taxi early in the morning, or queue up in the afternoon when everyone is leaving. However, please be warned that a majority of hotels in the area are not adequately insulated and the rooms can be extremely cold in winter. Warm water is usually restricted to specific hours in the evening. Moreover many hotels have power outages. Consider choosing one of the only two international chain hotels (Sheraton or Intercontinental) in winter if this is a problem. Most hotels only accept cash. There are ATMs near the park entrance and at other places around the area. Prices vary widely across seasons, and can be prohibitively expensive in peak season, but can be had at a bargain price in peak winter. Also, a lot of the hotels have different level "rooms" within the hotel which are priced accordingly. Thus you see a great deal of price ranges within the same hotel. Prices vary according to the season and booking in advance is essential. Provided you speak and read Mandarin, bookings and purchase of tickets can be done online at [www.jiuzhaigouvalley.com]. There is one authentic homestay  (others are "Tibetan themed" often outside-owned) run by a local family a 15 mins drive from the park entrance. They do not have a website but they can be contacted at . There are also two hostels in the immediate area. Uncle Jiang's family house, Peng Feng Village, Jiuzhaigou Park Entrance is recommended. They have free pick-up (from where?) and offer packed lunches (sandwiches) for ¥20. There are a number of cheap hostels to the West of the park entrance - they can be found on the usual websites e.g hostelworld [www.hostelworld.com/jiuzhaigou]. You should be able to get dorm beds for around ¥35 and double bedrooms for ¥150. Please bear in mind that prices vary wildly during peak season. Using the local travel websites will often be cheaper than booking directly from the hotel or from one of the larger travel agencies. However, they are pretty hard to find unless you are able to search online with Chinese characters. As of July 2009 hiking and camping have been made available within the Zaru Valley  of the national park. Zaru Valley has an amazing 40% of all the plant species in the whole of China and if you are to see any of the wildlife of the national park, this represents the best chance. The main hike is a 3-day hike, following the pilgrimage of the local Bebbo Tibetan Buddhists around the 4,500 m+ (14,764 ft+) Zhayizha Ga Mountain. The highest tourist destinations reach heights above 3,100 m (10,170 ft) and altitude sickness is a possibility. In the winter months the park is extremely cold and it is necessary to dress warmly. Chinese tourists dread standing in line and there is a lot of pushing and shoving getting on and off buses. Make sure you don't get pushed in front of an oncoming bus. 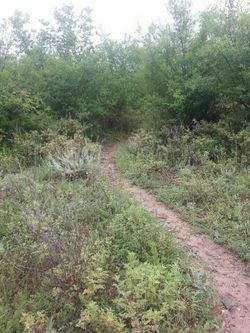 Crowded trails can also be dangerous and if you walk on the edge of a path it is likely a shoulder or elbow with push you off. To really enjoy your time in the park you should walk on the trails on the opposite side of the lakes from the roads. These trails have considerable less tourists and you can really experience the serenity of the national park there. English is not widely spoken in Juizhaigou. Jiuzhaigou is one of the most expensive National Parks anywhere in the world, a full-price entry ticket plus bus ticket will set you back a whopping ¥310 (US$50). Here are some tips to help you save some cash. 1. Don't buy the bus ticket. It is a nice 3hour walk along the riverbank from the park entrance to the Nourilang Waterfalls, from where you can catch the buses - there are no conductors checking for tickets from there onwards. Beware of a couple of official-looking scammers along the trail who may tell you that the last bus is about to leave and that you must pay them immediately if you want to catch it (or any other ridiculous story). 2. Use your "student card" to get half-price entry. 3. Bring your own water. A 500ml bottle is ¥5 inside the park. 4. Bring your own food. Cup noodles are ¥15 inside the park. You should be able to get hot water from the guy at the noodle stand at the Nourilang restaurant area. Locals selling noodles will ask for ¥10 for hot water from their flasks. 5. Get up early - the park can absolutely be seen in one day, no need to pay the astronomical entry fee twice. Everyday there are buses going to Songpan, taking two hours, Chengdu (10 hours), Guangyuan (6hours), Lanzhou (13 hours) and Huanglong National Park (2-3 hours). This page was last edited on 30 July 2018, at 09:06.